Correspondent|Doctors at public hospitals, who went on strike on Saturday for the second time this year to demand better pay and conditions, are vowing to continue with their industrial action until the government addresses their demands. Zimbabwe is short of U.S. dollars, the currency it adopted in 2009, causing price spikes and shortages of basic goods, medicines and fuel. 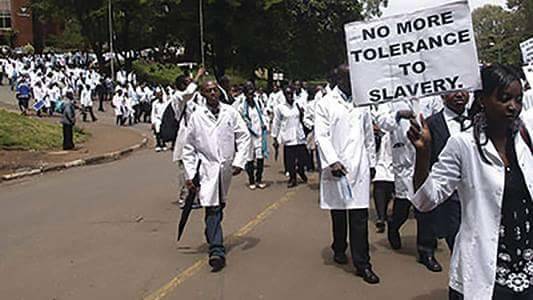 Mathabisi Bebhe, secretary general of the Zimbabwe Hospital Doctors Association which represents more than 1,000 members, said most junior doctors at the five major hospitals won’t go back to work until government addresses their demands. Health Minister Obadiah Moyo could not be reached for comment. The government has previously said doctors should present their grievances while at work and has relied on military doctors to help at state hospitals during strikes.